An old favourite stitched on 18-count aida, with coloured roofs on 14-count aida. These pieces sparkle with metallic thread and beads in keeping with the festive season. A ribbon loop turns them into hanging decorations, or add them to a winter scene to give a memorable centre piece for your table. 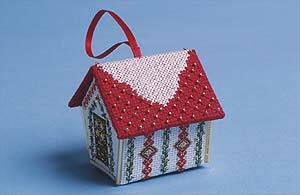 The finished size is approximately 2¼" (6 cms) high, and the kits contain 18 & 14 count aida, stranded cotton, beads, ribbon, felt, plastic canvas, needle, chart and full instructions. Traditional colours of red, green and gold for a festive look.